We are truly blessed to live in a free land. The Fourth of July is fast approaching and I designed this project to honor loved ones who have served in the armed forces. My grandfather and his four brothers all served (in different branches) in WWII. My husband’s father was injured just before the Battle of the Bulge. More recently, my nephew and sister in law served in Iraq. 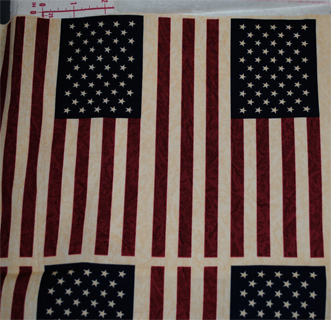 I found the flag fabric on clearance (Georgetown by Moda) and knew it would be useful for a future project. 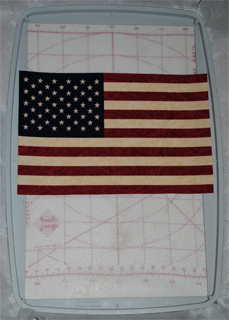 Because I wanted it to hang flat, I ironed a firm stabilizer to the back of one flag unit and trimmed to the edges. For the embroidery, I used Ann’s Quick Font Lettering system. 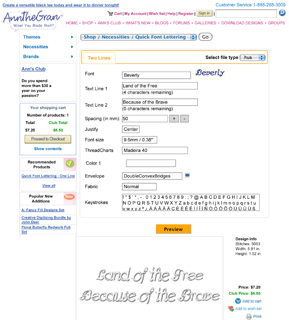 It is quick, easy, hassle-free, and affordable. I chose the Beverly font with two lines of centered text at a size of 9.6 mm shaped in double convex bridges. One of the best parts of this software is that you can change the font styles and shapes and see how the design looks on screen before finalizing. In addition to seeing how the stitch-out will look, you can see how large the design will be and increase or decrease the font sizes as necessary to fit. When satisfied, just pay and download. I’ve included the FREE design here for you to use. Be sure to check out my blog on this great program. I hooped adhesive stabilizer, scored around the inside of the hoop, and peeled the protective cover away. 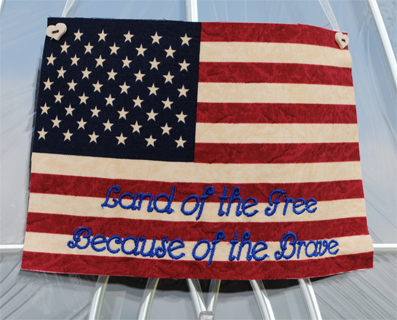 I finger-pressed the flag to the adhesive, being sure I placed the stitch area in the center of the hoop. After stitching the design, I trimmed the jump stitches and peeled the adhesive stabilizer from the back. I used a piece of ribbon as a hanger and stitched an end to the back of each top corner through buttons I placed on the front side. You could also embroider wording on the flag and adhere it to a shirt with iron-on adhesive just like an applique, then stitch around the edges with a satin stitch or blanket stitch. Celebrate with those you love!